Denver, CO - His Grace Bishop Maxim of Western America visited the church community in Colorado and the St. John the Baptist parish on the occasion of their Church Slava. The bishop arrived in Denver on Saturday, January 22 at around noon. Upon arriving he, together with the local priest Fr. 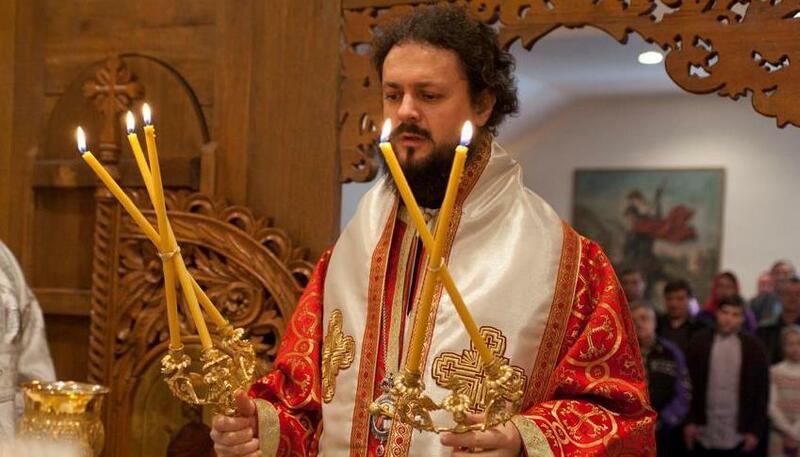 Radovan Petrovic, visited the Greek Orthodox Metropolitan Isaiah of Denver and his beautiful episcopal quarters. Metropolitan Isaiah joyously received Bishop Maxim. The bishop venerated the wonder-working icon of the Most Holy Theotokos located in the bishop's chapel. Thanking the metropolitan for his gracious hospitality he extended an invitation for him to visit the Serbian diocese as well. Afterward the bishop visited the parish home and the priest's family and from there they continued to the newly renovated church in Lakewood. Fr. Boris Henderson, from the local Russian parish, served the Vespers with some forty parishioners in attendance. At the end our bishop said a few words, focusing on the God pleasing work the faithful of this parish have done over the past year in bringing the church into order. Immediately afterward the bishop, together with the Vidovic family, this year's Slava kumovi, cut the Slava kolach in the church hall and blessed the koljivo. A dinner followed attended by some eighty parishioners and guests, Fr. Boris Henderson and Fr. John Armstrong with their families. Fr. Petrovic greeted everyone, first Bishop Maxim, who has for years now been visiting and encouraging the faithful of this parish, he then greeted all the guests and parishioners. Dragan Vukovic together with his family agreed to be kumovi for next year's Slava celebration. On Sunday, January 23 Bishop Maxim officiated at the Divine Liturgy assisted by Fr. Boris and Fr. Michael together with the host priest Fr. Radovan. There were 105 adults at liturgy (65 of which were from the Russian church) and 36 children. Children and some adults partook of the God-man Body of Christ. The bishop preached in spirit of the feast which our parish celebrates during these January days. He stressed the feast of Illumination, that is, cleansing, which demonstrates to us all that we can reach eternal life and heavenly riches through repentance. The bishop prayed that our Heavenly Father bless His inheritance, that is our children, youth and the generations to come. At the end of the service the bishop thanked the Russian choir who sang during the service as well as the celebrating priests. He also thanked and praised all of those who worked on beautifully renovating the church (the church board, parishioners and priest). Fr. Petrovic thanked the guests from the neighboring sister parishes for their help and expressed his hope that the relations between these two churches will continue to grow. He invited all to stay for the luncheon prepared by the parishioners of St. John. Though the hall was too small to receive the many guests everyone was served and had a beautiful time. Bishop Maxim had to leave in the early afternoon on his way to Chicago. Thus, bishop finished his visit to the "mountain" parishes of our dicoese (Oregon, Utah and Colorado) for this month.